Readers of this column will know that I had the opportunity to review the (10mm) Glock 40 Gen4 MOS. This highly versatile handgun is a great candidate for hunting, self-defense and target shooting. The 10mm round packs a wallop without excessive recoil and has flat shooting ballistics similar to a .357 or .41 magnum. What distinguishes this model is Glock’s new mounting system called the MOS (Modular Optic System), which easily allows a red-dot optic to be placed on the slide. You might ask, what more could one possible want? Lock rings (as on this crimp die) are cinched down with tiny Allen head screws (see tiny aperture at center) rather than locknuts. How about inexpensive ammo? You can get some great quality ammunition for this gun but shooting several hundred rounds of the good stuff makes for a rather expensive afternoon at the range. While Glock and other manufacturers understandably prefer that you use factory ammo, reloading is an option that any serious shooter should consider. Yes, it will take an investment of time and a few bucks, but reloading for 10mm will save you about 50% or more (not counting the time you invest on the actual labor). However, it’s not just about saving money. A hand load that is tailored to a specific gun can improve accuracy to a great degree. It’s also a practice that harkens back to another time before computer games, social media, and flat screen TVs. If you’re feeling nationalistic, it’s also a very American past time. Other than Canada, I suspect there are not a lot of places on this earth where the government will allow you the freedom to make your own ammo. (At least it was legal the last time I looked). 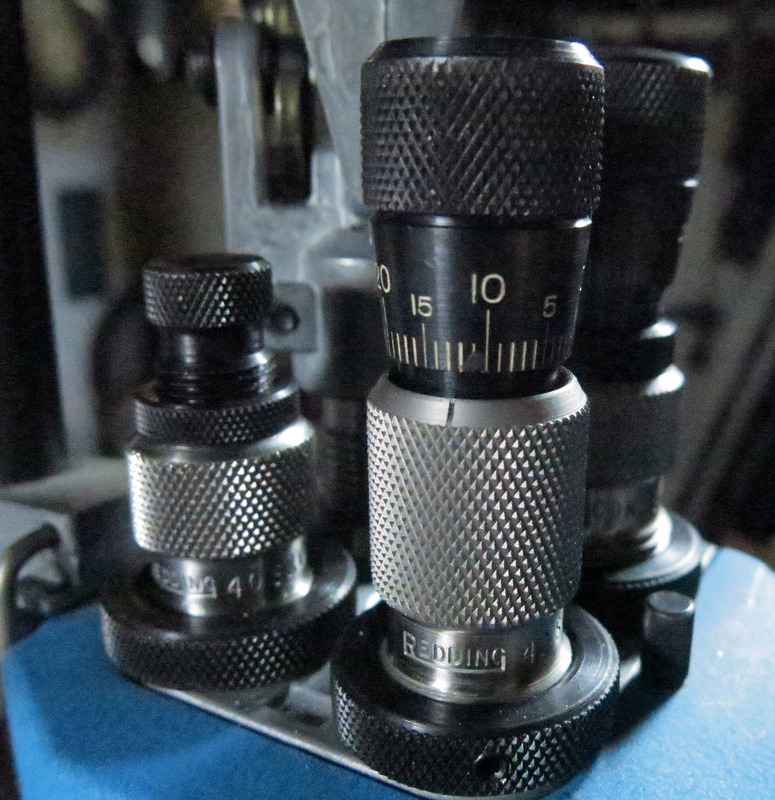 Micrometer adjustment at top enables fast, accurate, and repeatable changes in bullet seating depth and crimping. So how to get started? I like the progressive reloading machines and have had great luck with the Dillon 550B, which is excellent for hand guns and works well for rifles. Of course a big part of putting your reloading system together entails choosing dies that will size, seat, crimp your round. For 10 mm dies, we looked no further than Redding Reloading Equipment, an industry icon that has been in the business since 1946. Still a family owned company, they are focused like a laser beam on one thing–making high quality reloading gear. We opted for the “Pro Series”, a carbide, three-die set which is compatible with the Dillon Precision 550B. The carbide insert in the die allows you to size cases without applying case lubricant when seating, crimping or sizing. The chief attributes of carbide is that it’s harder, smoother, and more abrasion-resistant than steel. The downside is that it’s brittle. Thus when using a carbide sizing die, you’ll need to set the height of the die so that there is clearance between the shell holder and the die. Otherwise the force of the shell holder repeatedly impacting the die may cause the carbide ring to crack. Redding manufactures crimping and seating dies with a micrometer that is adjustable for bullet seating depth, each with increments equaling .001” which equates to .050” per revolution. This feature enables the hand loader to make fast, accurate, and repeatable changes in bullet seating depth, with no guesswork. Also using a wrench to tighten a locknut often means scraping your knuckles on the tool head or rounding the locknut—neither of which is desirable. Instead of locknuts, Redding utilizes lock rings on the dies to keep them adjusted properly on the tool head. The lock rings are cinched down with Allen head screws rather than locknuts. For this reason, it’s much easier to adjust Redding dies. 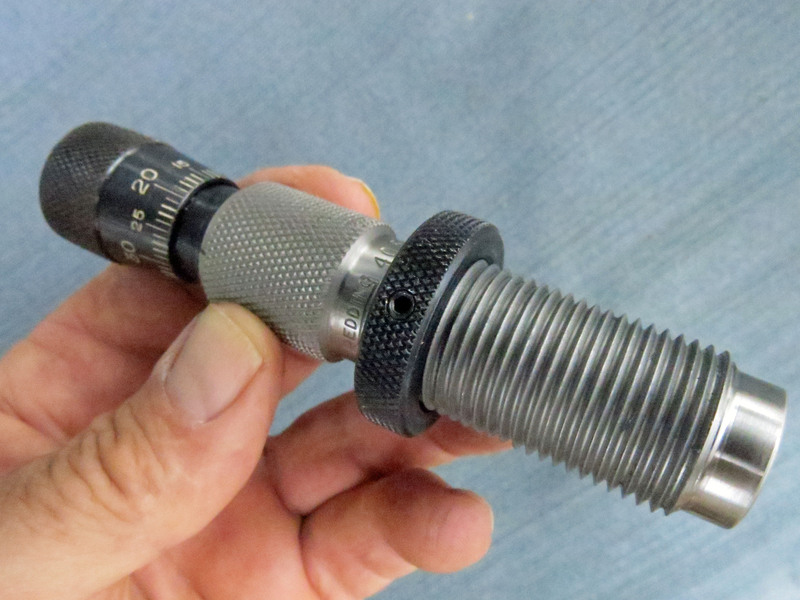 Redding has refined this system by utilizing a tiny piece of soft lead between the front end of the retaining/tightening screw and the threads of the (steel) die body. The lead serves as a buffer to prevent damage to the threads. (To loosen it you’ll need to give the ring a tap to free up the lock ring). Once the ring is tightened down you hand screw the die on the tool head and you’re quite secure. It seems a bit counter-intuitive, but it works fine and averts many a bloody knuckle! A slight bulge visible on case at right can be fixed with a steel die. The bulge, however, is purely an aesthetic issue and of no consequence to the shooter. In addition to the carbide-style sizing/decapping die, Redding offers a steel version of this same die which necessitates using a lubricant on the casing. If not the brass will get stuck in the die. It’s an older technology but the all steel units have a tighter tolerance between the die and the shell casing. This has one major advantage. Sometimes when reloading you may get a slight bulge in the brass where the base of the bullet causes a slight protrusion. It’s purely aesthetic but the steel sizing die is able to iron this out a bit. My inclination is not to worry about aesthetics and go with the carbide dies. The slight bulge has absolutely no bearing on performance. In the same vein, when using the seating die I noted that the seating process would produce a tiny ring or indentation atop the round nose plated bullet from Rainier. This wasn’t too much of a surprise, given how soft lead is. The tech support people at Redding told me this can be fixed by dabbing some hot glue inside the die and making a mold of the bullet so as to enlarge the contact point. I was not too concerned by the indentation which didn’t seem to effect the accuracy. Once you’ve got you dies, you’ll need the right components. Let’s start with the cases. Normally I’ve been a user of Starline products but we ran into a company at SHOT called Jagemann and decided to try their products for a change. Although not a household name, the company has been around since 1946 and in addition to producing OEM brass, they manufacture polymer magazines for a Glocks and other handguns). (In addition to 10 MM they also offer 9 MM, .40 S&W, .357 SIG, .45 AUTO, and 300 BLK). Jagemann cases are manufactured from American-made brass cups and according to the company undergo rigorous, in-line and post-production quality assurance testing. Jagemann brass is high quality and equal to any of the other manufacturers. Our experiences with this brass have been very positive. We’ve not used them long enough to rate their durability but in lieu of that, I’ve heard from other users is that they hold up exceptionally well. Until recently, the company has opted to sell via distributors such as Brownells but in the future plans to market directly to the public. We shot and loaded over 500 rounds of bullets made from this manufacturer with no problems. When reloading for a Glock, one thing to keep in mind is that cast bullets, which are the least expensive, are not an option. The hexagonal rifling on a standard Glock barrel could create a lead buildup so those who want to shoot cast bullets will need to go to a third party manufacturer such as Lone Wolf. Thus you’re left with choosing between plated or traditional jacketed bullets. Jacketed bullets, according to none other than famed shooter Jerry Miculek, are preferable in general for accuracy. 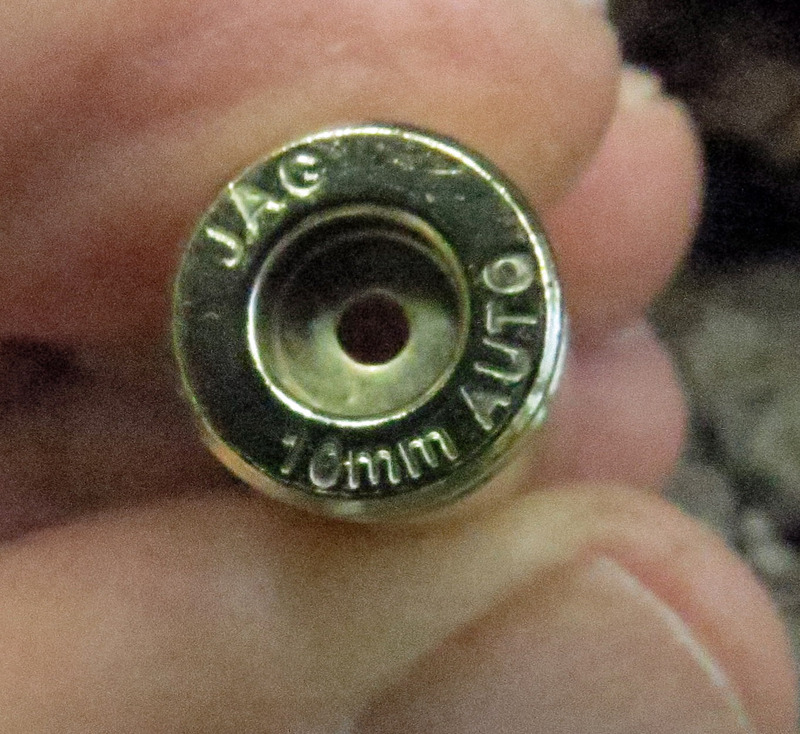 The downside is that jacketed bullets are by definition more expensive than plated products. If you’re just plinking, losing a bit of accuracy is not a big deal. However, if you’re trying to consistently achieve hits at longer distances, saying whacking an 8” plate at 100+ yards, you can’t afford to give up any accuracy. For this story we loaded both jacketed and plated bullets. First up was Montana Gold Bullets, which are produced by a family owned business located in Kalispell, Montana. Many seasoned match shooters regard Montana Gold jacketed bullets as the “Gold Standard” of match bullets. In reading the forums to do some research on the company, it was really hard to find any negative comments about their products. 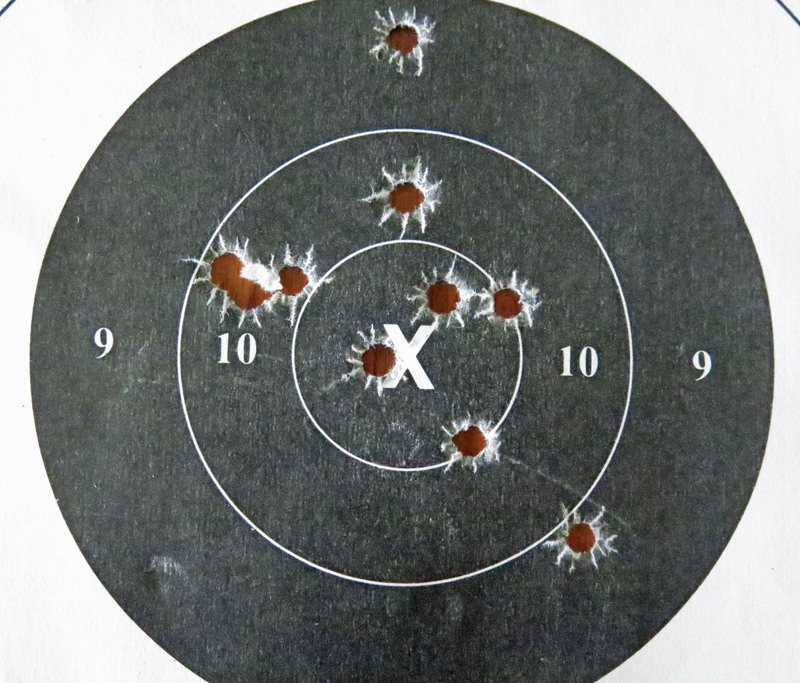 Hollow point bullets proved to be the best for accuracy, particularly at longer distances (+25 yards). Montana Gold (l) won out with Rainier (r) a very, very close second. At shorter distances most shooters would probably not find much of a difference. Rainier’s plated bullets have the edge in the affordability department. We loaded about 600 of these Jacketed Hollow Point (JHP) bullets in both 165 gr and 180 gr flavors. As alluded to above, they are more expensive than plated bullets. 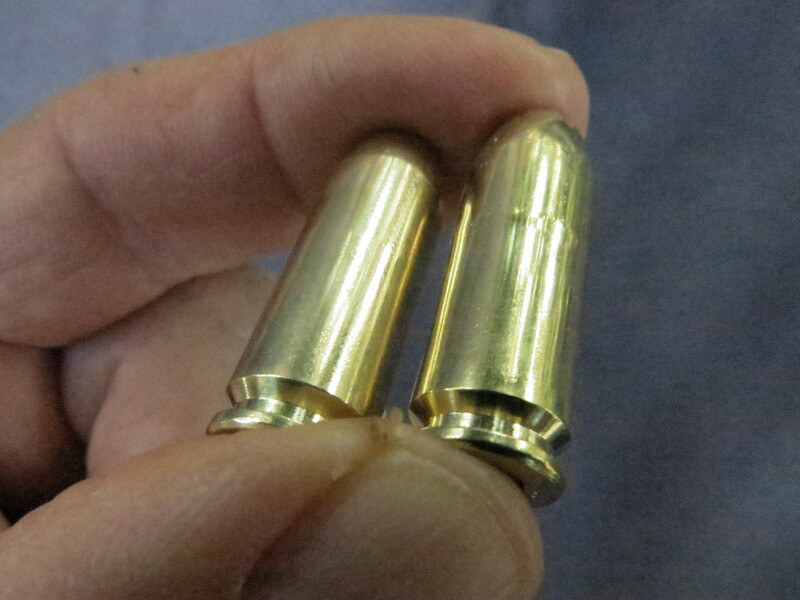 Figure on dropping about $160 for 1000 Montana Gold 180 gr bullets vs. $122 for plated bullets from Rainier Ballistics. Rainier, which produces plated bullets is also a good option. Rainier has been around for a long time and I’ve used their products for years. Rainier says that their bullets have become popular because they are reasonably priced, have nearly zero lead vapor emissions and, are accurate. I would say this is spot on. Their match bullets are also popular with competitive shooters. Based out of Tacoma, Washington, the company does their manufacturing in house and they extrude their own lead wire, swage their own bullet cores, do all of their electroplating and “restrikes” the bullet cores after they have been electroplated. “Restriking” is a second sizing after plating which offers better out-the-door quality. According to Rainier, “restriking” is highly uncommon in the industry. We loaded Rainier Bullets both in hollow point and round nose in 180 gr and 165 gr sizes. We also sampled a few rounds of Barnes Bullets which are manufactured from pure copper, and have a big following in the hunting and LE community. Designed for law enforcement and personal defense, 100-percent copper TAC-XP pistol bullets meet the requirements of lead-free practice environments. They maintain their original weight and track straight after being fired through intermediate barriers like car doors, plywood and automobile windshield glass. These are top of the line bullets but are really expensive. At 40 bullets for $24 they are not viable to plinking purposes. A typical group at 25 yards. Although this was with 165 gr Montana Gold JHP, it was representative of the Rainier product too. We used 6.8 gr of 231 powder. This article wasn’t intended to be a definitive discourse on 10 mm reloading. Our main goal was to look at high quality components and gear to reload for 10mm Glock. (Naturally you could apply this to other 10mm handguns.) We particularly focused on discovering what would work best for long distance accuracy with the new Glock 40 but I suspect that vast majority of people, with the possible exception of hunters, will not be shooting at distances of under 25 yards. The hollow point bullets were more accurate than the round nose variety at longer distances. Between the jacketed hollow points and the plated variety, I’d have to give the edge to the Montana Gold product. At shorter distances, maxing out at 25 yards, there was no discernible difference that we could see between the hollow point plated bullets from Rainier and the Montana Gold. At longer distances, Montana Gold had the edge on accuracy. Between the 165 gr and 180 gr bullets, our belief is that you’re better off, accuracy wise, with the heavier variety. If you’re going to plink, plated bullets, particularly the hollow point match bullets from Rainier are more than adequate. 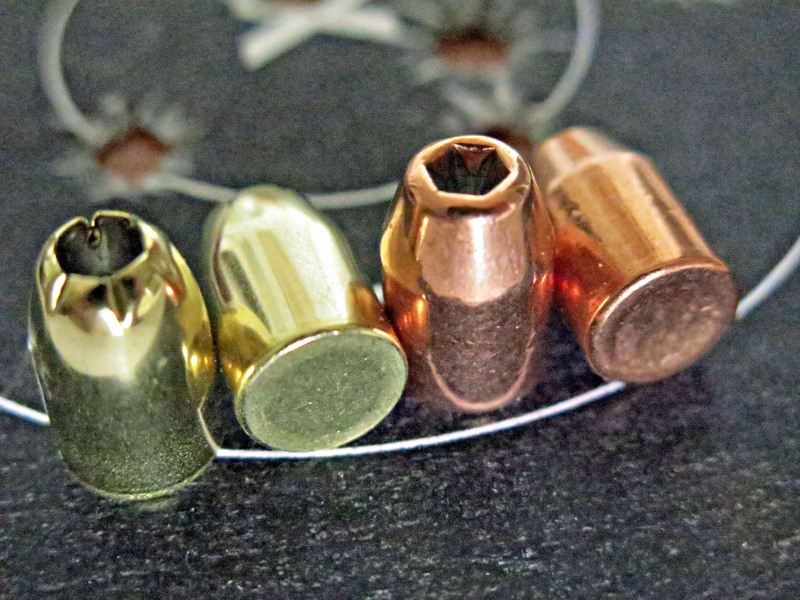 If your goal is pin point accuracy at longer distances, you might consider spending a few more dollars and shoot the jacketed variety from Montana Gold. In a future article on loading for accuracy we’ll look at powder and suggested loads. Previous articleIs Your Big But Holding You Back?